Families in Modi’s India are caught in a spiral of working class conditions in jobs pretending to be middle class, with their requirement for degrees and skills training. 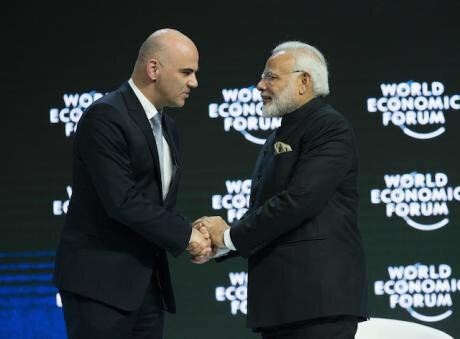 Alain Berset, president of the Swiss Confederation, shakes hands with Indian Prime Minister Narendra Modi during the opening ceremony of the World Economic Forum in Davos, Switzerland, Jan. 23, 2018. Xu Jinquan/Press Association. All rights reserved.At the World Economic Forum in Davos, the Indian Prime Minister Narendra Modi was welcomed by a big turnout at the plenary session and introduced by WEF founder, Klaus Schwab, as the leader of a country that is the “bright image of dynamism, of optimism”. For his part, Modi spoke of a vision of shared future that overcomes the fault lines of inequality, poverty, unemployment, and lack of opportunities. Ahead of the visit, Modi encouraged the presentation of India as the centre of attraction for the entire world. Closely on the heels of Modi’s platforming of India as a rising global force, NITI Aayog (National Institution for Transforming India, ironically headed by Modi) published a report on severe underemployment in the country, the Annual Status of Education Report (ASER) 2017 published findings on the failures of various programmes for education and vocational training of Indian youth, and the World Bank released data showing that the richest 1% in India now own 73% of its wealth. In short, not the best prospects for India. Modi, on the other hand, continues to insist, “If someone opens a 'pakoda' [fried snacks] shop in front of your office, does that not count as employment? The person's daily earning of Rs 200 will never come into any books or accounts. The truth is massive people are being employed.” PM Modi’s celebration of informal and precarious work as gainful employment is rightly being criticised. But what of the much-touted formal jobs generated as a result of encouraging foreign direct investment and privatisation post-1990? Unfortunately, the conditions of pakoda employment – informal, underpaid and precarious employment – are not limited to selling snacks and chai on the street side. As much as Modi would like to insist on India’s growth story, these conditions characterise the majority of employment in the country, including formal employment in services, the biggest sector of the Indian economy and the fastest growing service sector in the world. The numbers that demonstrate the success of the deregulation of the Indian economy – high GDP growth rate, increasing per capita income, rapid growth of services – carefully mask the exploitation and everyday struggles of common people, even those privileged enough to be employed. The idea that privatisation and foreign investment in the market has led to a surge of employment opportunities for the youth, particularly women, is popular (because if there are any bastions of women’s empowerment, they’re American multi-nationals, right?!) Perhaps the popularity of this idea is not so surprising. Dressed smartly in uniforms, young professional women in the gleaming malls and cafes of Indian cities may give an impression of upward mobility. But the smiles, the English greetings, and the lattes cover up conditions that are not so dissimilar from the informal self-employment that Modi speaks of as gainful employment. This hidden-away reality became obvious as I conducted research with young women workers in cafes and malls in affluent South Delhi in 2017. On an average, these young women earn Rs.8000 (USD 125) per month; income that their families heavily rely upon for everyday living expenses. To earn this salary, all of them work overtime, which they are never compensated for, often seven days a week, rather than their contractual 6 days a week. And even if calculated for just 25 days of work per month, their wages do not meet the minimum wage for the state of Delhi. These workers’ emotional labour, which is far from acknowledged, hides their utter physical exhaustion, which is often made visible on the swollen feet that have to get a night’s rest before starting all over again the next day. The limits of their earnings are made manifest in their inability to use the metro because the maximum fare has now been increased to Rs.60 (USD 1), in the impossibility of getting their degree certificates because they still haven’t paid the full fees, and in their negotiations with landlords for leeway in payment of rent on their Rs.5000 (USD 78) per month one-bedroom flats. And these are conditions that these workers cannot think of escaping since alternatives are few and far in between. As the Prime Minister’s image appears on Reliance Jio advertisements across the country offering low cost data services, young people get access to smartphones and 4G sims, but not to good quality education, housing, or infrastructure. Much as we’d like to believe, and the government would like us to believe, that these one-off purchases are signs of an upwardly mobile new middle class, reality counters this presumption. They are, rather, families caught in a spiral of working class conditions in jobs pretending to be middle class with their requirement for degrees and skills training. It is then no surprise that these young women, as well as men in their families, express a desire for ‘government jobs’, even preparing to sit exams while working seven days a week. In 2015, 2.5 million people applied for 600 Class IV government jobs in the state of Uttar Pradesh. The cry for government jobs may be dismissed as a historical affliction or just nostalgia but it is actually indicative of the lack of secure employment that can offer stability. A Class IV government job (lowest category of permanent employment) would pay twice the salary that my research respondents currently earn, with nothing to say of access to job security, provident fund, and pension. While informal employment is often considered to be the problem marring India (and rightly so), we also need to pay more attention to the conditions of formal employment that the country is generating and hopes to generate more of in the future. It needs to be reiterated that the underpayment, exploitation, and precariousness that young women workers have described characterise jobs that are actually on the better end of the employment situation in the country. These jobs would be categorised as formal, regular, salaried employment but the experience is far removed from that categorisation. As underemployment and exploitation pervade the vast majority of employment opportunities in the country, including in emerging gleaming globalised urban spaces, one needs to ask – what kind of economic and social future are we looking towards? The need for sustainable, secure, and fairly paid work is urgent. Rather than touting informal and poorly paid formal work as gainful employment, the government needs to consider India’s longterm social and economic prospects for the disgruntled majority of its population. Employees operate the telephones at the Touch Solutions Ltd call centre in New Delhi. Flickr/©ILO/Benoit Marquet. Some rights reserved.